A limited edition print by award-winning artist Robert Watts, featuring the Lockheed Constellation the most luxurious airliner of its day. In the history of civilian aviation there are few aircraft which have caught the attention and imagination of enthusiasts in the way the Constellation has. It was a graceful, powerful airplane that looked the part, and today is remembered as one of the world’s great airliners. 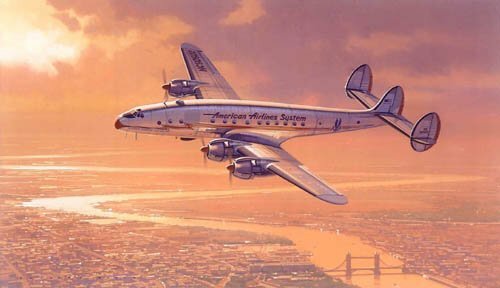 Robert Watts captures the romance of that golden era of passenger flight in his nostalgic painting of a L-049 Constellation. Seen in American Airlines colors, a ‘Connie’ descends over London in the soft early morning light after an overnight flight from New York. Limited edition prints are signed and numbered by the artist Robert Watts and provide a handsome reminder of a bygone era in the history of aviation.